Your journey to Griffith is about to start. Once you have accepted your offer, here are the next steps you need to make to organise your move to Australia. Whether you are studying at Griffith University or Griffith English Language Institute, we have some great tips to help you get started. To help you get ready for this new and exciting challenge, we have put together some useful information to prepare you for your arrival in Australia. This includes when to arrive, airport pickup, accommodation, money, phones, medications and much more. Applying for your visa is an important first step to ensure you arrive in time for orientation. You also need to understand the conditions of your visa and become familiar with your health insurance policy. Undergraduate and postgraduate students will need to enrol in classes before the start of the trimester. Once you receive an email with your Griffith student ID number and password, you can enrol before you leave your home country or when you arrive in Australia. You will need to enrol in classes before the start of each trimester. If you are a Study Abroad or Exchange student, you will need to enrol in your approved courses before the start of trimester. Once you have accepted your offer, the Griffith English Language Institute will enrol you in your English courses. Please log into myGriffith to ensure your contact details are up to date before you arrive in Australia. Orientation includes everything undergraduate and postgraduate students need to get ready to study! Packed with information about living in Australia, skills workshops and tours – Orientation Week is your chance to meet staff and students, explore our campuses and find out what to expect as a Griffith student. Make sure you say hello to our Griffith Mates and attend some of their social events, as it is a great way to meet new people and make friends. You must attend the compulsory International Welcome and Orientation session and your School orientation session. Orientation includes everything study abroad and exchange students need to prepare for their Griffith trimester experience in Queensland! We'll cover vital information about living in Australia, navigating your way around the Griffith online environment, academic life, health and student services and much more to make your stay here the best experience you've ever had. You'll have the opportunity to meet current students, ask questions and attend some social events where you can meet people from all over the world and make new friends. Orientation is compulsory for all international inbound study abroad and exchange students. Our social events for undergraduate, postgraduate and Study Abroad and Exchange students are a great way to meet new people. Need a helping hand to settle into life in Australia and on-campus? The International Student Buddy Program pairs new university students with senior students. Griffith Mates are a diverse group of students who speak around 46 different languages. They welcome students during Orientation Week and host fun events and volunteering activities to help you make new friends, expand your worldview and enhance your cross-cultural and leadership skills. How prepared are you for your move to Australia? Take our quiz and see if you are ready. Have you organised your student visa? Is your flight to Australia booked? Have you found accommodation for at least your first few days in Australia? Have you booked your pickup from the airport? Is your schedule for Orientation planned? Are you enrolled in your courses? Have you registered for the International Student Buddy program? Do you know about the Griffith Mates program and the activities, trips and tours you can be involved in? You are on your way! 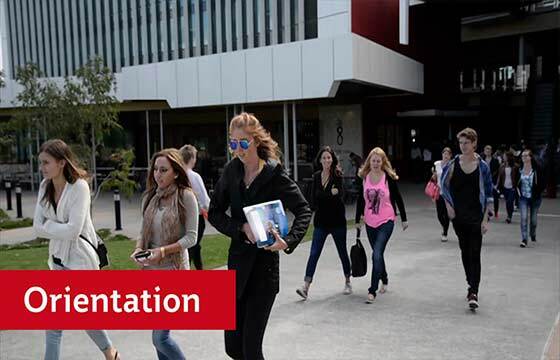 We know there is so much to learn before you even start at university – remember to stay up-to-date on all the opportunities available to you at Griffith throughout your program. You can apply for your visa as soon as you receive your Confirmation of Enrolment. With your CoE, you can apply for your visa using the online visa application system at the Department of Immigration and Border Protection. It is a good idea to arrive a few days before Orientation to give yourself time to get over any jetlag, settle in, and become familiar with your new surroundings. Both Brisbane and the Gold Coast have international airports, however you may need to first fly into Sydney. We recommend you book temporary accommodation for your first few days in Australia. On-campus and off-campus accommodation options are available. We offer a free airport pickup service for all new students who are arriving for the first time. It is the easiest way to get from the airport to your pre-booked accommodation. You must book your pickup 72 hours before your scheduled arrival in Australia. Packed with information sessions, skills workshops, social events and tours, Orientation is your opportunity to meet staff and students, and explore your campus. Undergraduate and postgraduate students can use our Orientation planner to get the most out of Orientation. Undergraduate and postgraduate students will need to enrol in classes before the start of trimester. Once you receive an email with your Griffith student ID number and password you can enrol online. Griffith English Language Institute students are automatically enrolled in classes. Need a helping hand to settle into life in Australia and on-campus? The International Student Buddy Program pairs Griffith University students with senior students for a weekly coffee and a chat. This is a safe and comfortable environment where you can ask questions about Griffith University, Gold Coast, Brisbane and Australia, as well as practice your English. It is also a great way to make friends! Griffith Mates are a diverse group of students who speak around 46 different languages – the Mates program aims to facilitate meaningful interaction and lasting connections between students from all over the world. Griffith Mates host events, activities and day trips to help you make new friends, expand your world view, and enhance your cross-cultural leadership and communication skills.